CT and MRI images are reviewed to evaluate each patient for a number of important features, including renal lesion size, lesion location, the number of renal arteries and veins, the presence or absence of renal vein tumor and inferior vena caval (IVC) tumor extension (and the degree of extension), enlargement of local, regional, and distant lymph nodes, and the presence or absence of local or regional metastatic disease. Tumor size and the presence of renal vein and IVC tumor thrombus and lymphade-nopathy are all criteria used for staging. 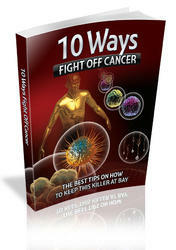 If the patient has a low-stage tumor and is an NSS surgical candidate, images are transferred to a dedicated 3-D imaging workstation for postprocessing typically using real-time volume-rendering techniques (38). Surface-shaded display renderings have been used for NSS surgical planning but are limited by the need for intensive image editing, which is too time consuming for most radiologists. Volume-rendering typically requires little image editing and preserves the entire dataset (Figs. 6 and 7) (9,10,38,39). Figure 6 Volume-rendering of renal tumor before NSS. (A) Conventional axial image and (B) volume-rendered image; volume-rendering uses the entire dataset and projects a 3-D view of the renal tumor (arrow). The psoas muscle (P) and spleen (S) are seen and provide relational cues to interpreting the image. Abbreviation: NSS, nephron-sparing surgery. Figure 7 Volume-rendering for NSS. 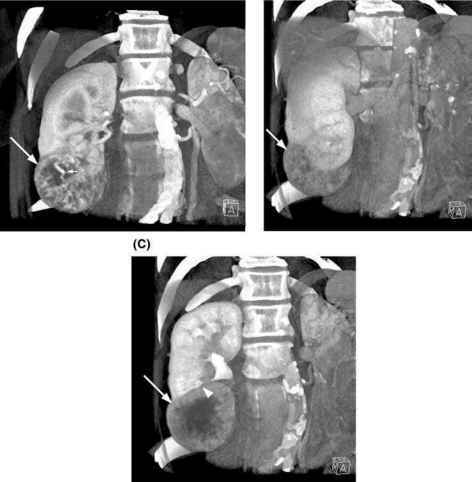 (A) Vascular phase and (B,C) parenchymal phase CT data volume-renderings show a right lower pole renal tumor (arrows). With the anterior plane of the image outside the kidney, the surface of the kidney is seen, and the component of the tumor exophytic from the kidney is identified in (B). By using a ''clip plane'' to image inside the kidney, a large arterial branch is seen within the tumor in (A) (short arrow), and the depth of extension of the tumor into the renal hilum is also seen in (C) (arrowhead). 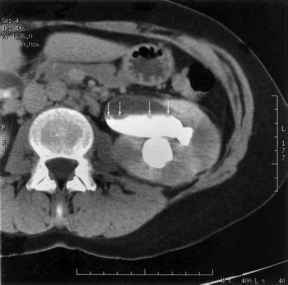 Abbreviations: NSS, nephron-sparing surgery; CT, computed tomography. A CT technologist can create MPR and MIP images easily, but because of the quality of information needed for surgical planning, it is often most beneficial if the radiologist performs real-time 3-D volume-rendering on a dedicated 3-D workstation. Our current practice is to create one or two short MPEG-encoded (.avi) digital movie files for each case illustrating the critical anatomy for surgical planning, but a set of static images, either digital or filmed, may also suffice. The scope of the information provided by the 3-D imaging was developed in conjunction with a urologist highly experienced in performing NSS. We recommend a thorough discussion between the radiologist and the referring urologist regarding their surgical approach and surgical planning needs. Because the surgical technique necessitates control of the renal vasculature, the renal vasculature is rendered first using the images from the vascular scan phase. This portion of the rendering shows the size, origin, and course of all renal arteries and veins, major segmental arterial branches, the left adrenal vein, the gonadal vein, and any prominent lumbar veins (Figs. 8-11). Next, using the renal parenchymal phase, renderings are obtained to show the position of the kidney, location of the tumor, depth of extension, and relationship to the pelvocalyceal system (Fig. 12). The rendering process takes anywhere between 10 and 30 minutes, depending upon user experience and the complexity of the case. 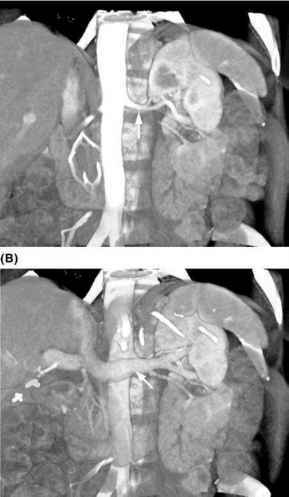 Figure 8 Conventional left renal vascular anatomy: Volume-rendered image of the left kidney during the vascular phase shows (A) single left artery (arrow) and (B) single left renal vein (arrow). Figure 9 Anatomic left renal arterial and vein variants. An early apical polar branch is seen (black arrow) supplying the upper pole of the left kidney entering from the cortex. 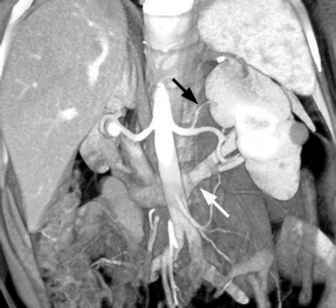 A retroaor-tic left renal vein (arrow) is also identified. Retroaortic left renal veins usually cross behind the aorta several centimeters below the level of the renal artery. from the cortical phase data results in a dataset that can then be used to assess the true enhancement within renal lesions, facilitating characterization of the lesion (Fig. 13). A gadolinium-enhanced 3-D gradient echo magnetic resonance angio-graphy (MRA) sequence provides inherent suppression of background signal and gives excellent volume-rendered views of the renal vasculature (Fig. 14). Subtraction of the precontrast data from the arterial phase data results in a dataset that has a high signal contrast within the arteries and a suppressed signal in the rest of the image, which can then be used to produce angiographic images, such as MIPs, with minimal additional editing needed (40). The venous phase-enhanced images are useful in determining whether there is any venous invasion (Fig. 15). Sequences acquired or reconstructed in the coronal or sagittal planes are often helpful to the urologist in defining lesion location/orientation within the kidney.